Dubai is a dashing, dizzy place: cars are fast, malls are massive and 'scrapers are high. If you are looking for the world's tallest, faster, largest, highest or most expensive... the chances are you'll find it here. Dubai is rushing through the 21st century so fast that it is hard for the rest of us to keep up. It is a frenzied and fabulous place to be, but where do you go when all the frenetic fun gets too much? 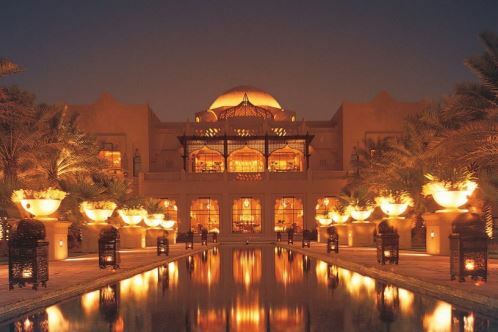 We found an oasis of calm in this turbo-charged desert city; the One&Only Royal Mirage. The resort is right in the heart of the action, a short limo drive from one of Dubai most impressive hangouts , the Dubai Marina and Mall of the emirates and yet.. And yet...the moment our taxi slides through its golden gates and into the hotel grounds the city slips way. We're in a parallel universe of quiet gardens and fountains, orange trees and shady palms. It is so unreal it does indeed feel like a mirage - a shimmering, magical place. Luckily this mirage doesn't disappear as we get closer, it only gets better. We are staying at The Palace, one of 3 hotels that make up the Royal Mirage complex. Inside the lobby keyhole-shaped arches frame a delicate fountain and indoor palm trees reach up towards the domed ceiling. It is a palace fit for Scheherazade and I'd be more than happy to book in for 1001 Arabian nights, sadly we're only here for three. Along the corridor towards our room giant Alibaba pots and white archways continue the Arabic theme but nothing is overdone; this is Arabian chic meets Madison Avenue, desert design with an overlay of elegance, with all the style you expect from a One&Only resort. Service here is discrete but impeccable. Our butler on the Gold Club floor is so desperate to do our bidding we are almost sorry that all we really want to do is chill by the pool and stroll around the resort's 65 hectares of unbelievable gardens. He could and would have arranged so much more had we needed him to. It is so peaceful in the hotel gardens that I am startled when I look up and see the skyscrapers of Dubai behind the palm trees. A slivery ribbon of private beach is dotted with white umbrellas and colourful cabanas. We don't even have to leave our serene sanctuary to eat as within the hotel's grounds there is a sparkling array of choice from Olives, for a taste of the Mediterranean; Tagine, for Moroccan, Celebrities for international cuisine and the Beach Bar & Grill for seafood and grills. At the Arabian Court there are three more restaurants that Palace guest can visit including modern-fusion at EauZone. There is even an outdoor lounge where guest relax on cushions enjoying the traditional delights of the shisha pipe. One evening we take the private ferry over to the 101 beach bar at sister property, One&Only The Palm, where the menu is masterminded by Michelin-starred chef Yannick Alléno. We order cocktails and sit and gazes out at the indigo night, far enough away from the Dubai bright lights that we can actually see the stars. Ultimate Luxury: T he separate two-bedroom Beach Garden Villa Residence with a private driveway entrance, dedicated parking and its own temperature-controlled swimming pool. Insider Secrets: Book your ferry to sundowners at 101 bar One&Only The Palm ahead of time it is pretty popular trip over. Junior Luxies: Well catered for - the gardens and beach are wonderful for families, just watch toddlers near the fountains.